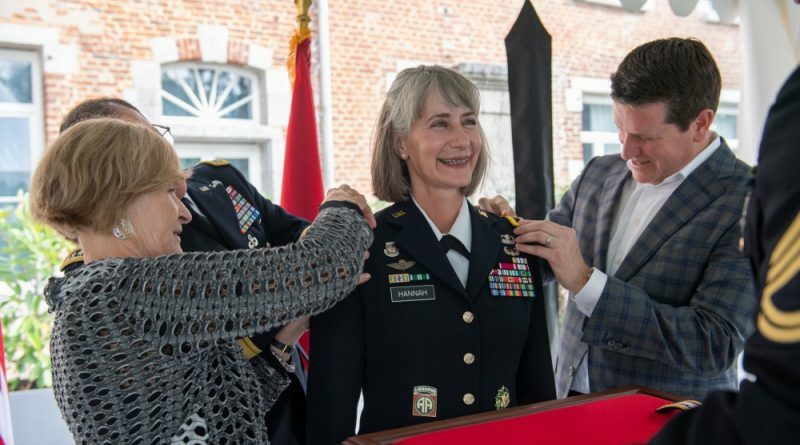 MONS, Belgium – The U.S. Army Public Affairs Branch welcomed a new general officer to its ranks, an officer who has had significant influence on her branch and the Army during her 27-year career. The officer presiding over the ceremony was Gen. Curtis M. Scaparrotti, Supreme Allied Commander Europe and Hannahs long-time mentor. Possibly more than any other rank, the trust, faith, and confidence the nation puts in its Brigadier General is truly special, said Gen. Scaparrotti. What is interesting about Amys promotion is that Public Affairs fulfills the Armys obligation of keeping the American people informed and setting the conditions that lead to trust and confidence in Americas Army in peacetime and war. The ceremony was carried out in accordance with Army tradition, with Hannah receiving some of the items incumbent with her new rank including her one-star flag and her general officers cap. I know this promotion comes with great responsibility and I thank the Army for giving me this opportunity, said Brig. Gen. Hannah. I am here today as a testament to those who taught me, who shaped me, who tested me and who made me stronger. She has also deployed multiple times in support of U.S. missions across the globe including Iraq, Afghanistan, Cuba, and in support of relief efforts in the wake of Hurricane Katrina. In spite of a career filled with difficult jobs and a high operational tempo, Brig. Gen. Hannah still earned two Masters degrees from American University and The Eisenhower School of National Security and Resource Strategy. Hannahs next assignment will be as the director of the U.S. Army Marketing and Research Group, a unique challenge that mentors throughout her military agree she is well prepared for including Lt. Gen. (Ret) Stephen Lanza, who was the Chief of Public of Affairs at the Pentagon when she was the Deputy of the Media Relations Division. Amy is a leader! (She is) so much more than a PAO, (she is) an absolute professional strategic communicator who understands the operational impact of information and the need for building an effective communication strategy, Lt. Gen. Lanza said in a letter to Gen. Scaparrotti. She is the role model for the branch and has done more than anyone I know to operationalize public affairs.